The product can be identified by the batch code (manufactured date) and UPC code printed on the back of the individual plastic bag or on the master case label. This product is a frozen raw poultry product (see Safe Handling Instructions on package) and has a shelf life of one year if kept frozen. Listeria is a bacteria that can cause serious and sometimes fatal infections in young children, frail or elderly people, and others with weakened immune systems. Animals’ ill with Listeria will display symptoms similar to the ones listed above for humans. The recall was a result of a routine sampling program by the Michigan Department of Agriculture and Rural Development resulting in a positive test for Listeria monocytogenes. 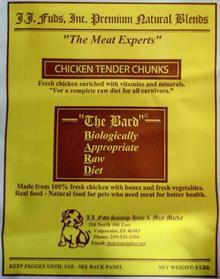 The company has not received any reports of dogs experiencing nausea and diarrhea that may be associated with these specific products. The company has received no reports of human illness as a result of these products. J.J. Fuds, Inc. will immediately start working with distributors and retailers to properly dispose of any affected product left on freezer shelves. The company will also be working with distributors and retailers to recall this product from pet owners to ensure the proper disposal of any affected product that has been purchased. 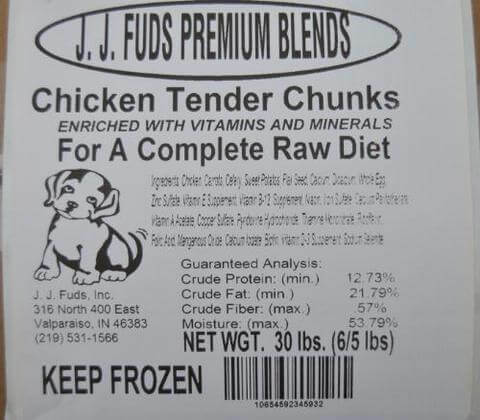 For further information or questions regarding this recall, consumers are asked to contact the company at jjfuds.com or call 888-435-5873 Monday through Friday, 8 AM to 4 PM CT.
Posted on January 24, 2015, in Uncategorized and tagged dog, food, Fuds Chicken Tender, J.J. Fuds, listeria, Listeria infection, Listeria monocytogenes, pet food, pet food recall 2015, raw pet food, recalled product. Bookmark the permalink. Leave a comment.